It was CHEMAPALOOZA on March 16, 2017, in Lake Charles, Louisiana. 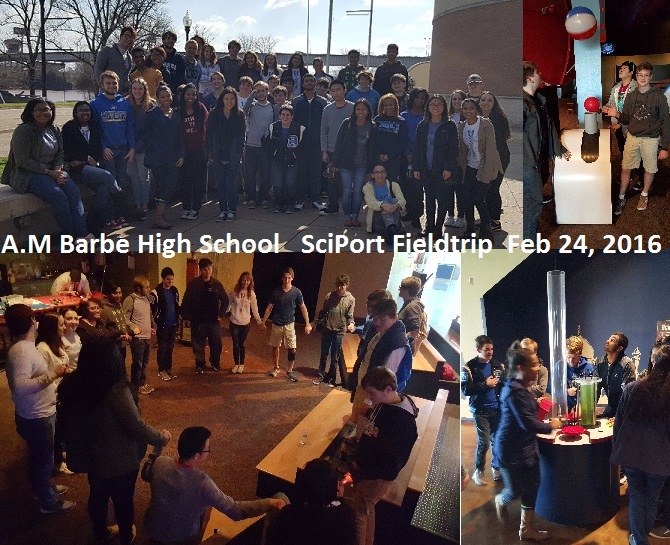 Barbe High School ChemClub and AP Chemistry students visited their feeder school, S.J. Welsh, to perform multiple experiments and demonstrations with every eighth grade science class. 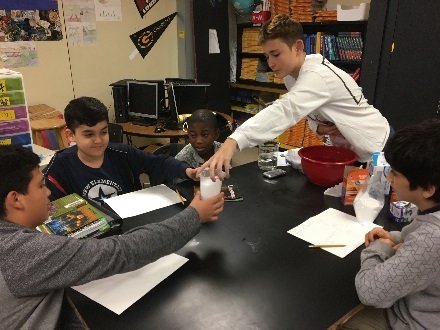 Approximately 400 eighth grade students had the opportunity to observe demonstrations like the Blue Bottle, Dry Ice/Density of Gases, and relighting a candle using the trail it produces after you blow it out. Barbe High School students performed all demonstrations and explained the science concepts behind each one. 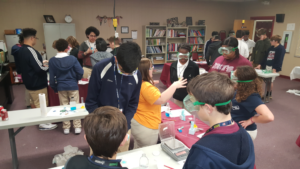 In addition to the demonstrations, Barbe students led the middle school students in three hands-on lab experiments. Students rotated in 15-minute intervals between three stations that were designated Maroon, Blue, and Grey, from the school colors. Each station had one hands-on lab investigation and one demonstration. 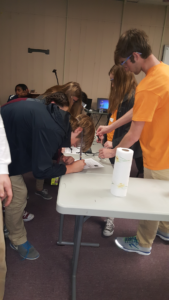 In the hands-on investigations, students learned to pipet using a pipet pump during the Vitamin C Iodine Clock experiment (a green chemistry version) and measured the rate of reaction due to changes in concentration. They learned to take electronic temperature readings using a Vernier Lab Quest for the Thermodynamics lab investigation, in which they determined if the enthalpy of solvation was exothermic or endothermic. Lastly, they performed a chemical reaction to form a gas and a precipitate, to observe some typical signs of a chemical reaction, while also learning how to tare and weigh a reactant and how to read a graduated cylinder’s meniscus. Each eighth grader was given a cardstock Lab Report to record their data and observations from each station. Participation by all students was phenomenal. CHEMAPALOOZA was a great success and Barbe Students have been invited back next year. We hope to make CHEMAPALOOZA an annual event going forward. ACS ChemClubs come in many varieties, and in our case we are the STEAM club from Saratoga High School (SHS) in Saratoga, California. In case you have not heard the term, STEAM stands for Science, Technology, Engineering, Arts and Math. 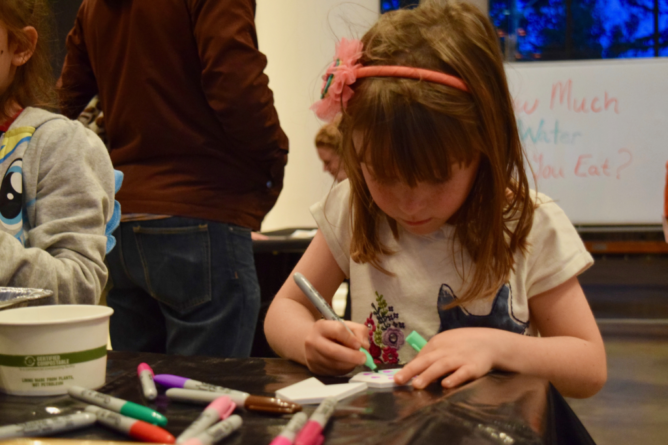 We were engaged with lots of different science activities related to art at various events in the San Francisco Bay Area. One such example was the Family Night at the California Academy of Sciences. 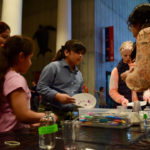 At the California Academy of Sciences, some 1,500 students from underprivileged schools the Bay Area were invited to enjoy an evening session full of hands-on science activities. The Academy reopened after closing hours and allowed the participants to go to every section of the Academy. The Academy was also filled with booths where children could try hands-on activities. Our SHS STEAM Club sponsored one of these booths and we were able to attract around 300 children per night at our booth! 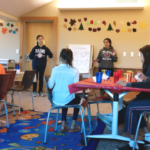 Another science activity we participated in was a community outreach program at the Saratoga Library, which is right next to our school.At the Saratoga Children’s Library our club was able to provide three different kinds of hands-on science activities for the residents of our city. 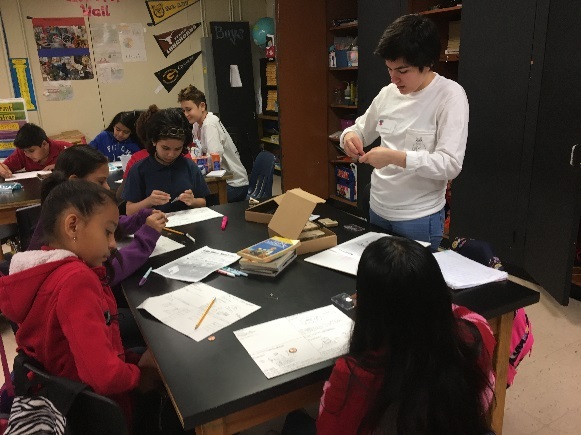 Thanks to a ChemClub Community Activities Grant from the American Chemical Society (ACS), students at Saratoga High School were able actively engage in teaching and learning science in our community. We thank ACS for the grant that allowed us to explore such these of opportunities in our community. Science is pretty cool, especially when you get to teach it using demonstrations and hands-on experiments. 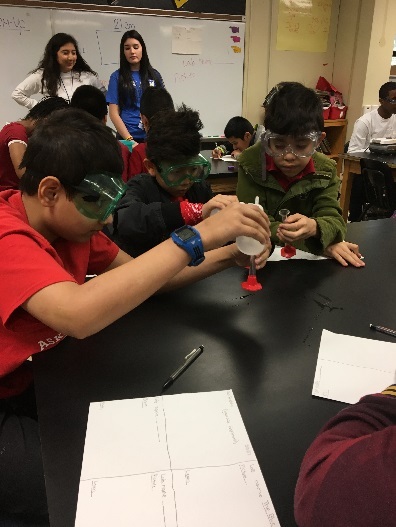 Thanks to a ChemClub Community Activities Grant from the American Chemical Society (ACS), students from Westside High School in Houston, Texas were able to show the 5th grade students at Askew Elementary School just how exciting chemistry can be. 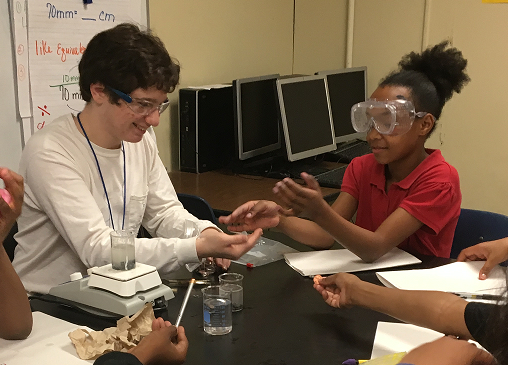 Members of the Westside High School Academic Science Demonstration Chemistry Club spent 2 months during the fall semester and 2 months during the spring semester of the 2016-17 school year planning and organizing our “Morning of Chemistry” days. Once our preparation and planning was complete we presented two morning sessions to the students at Askew Elementary School. 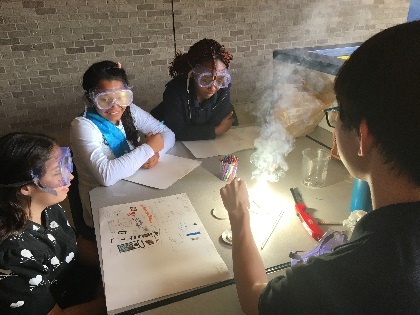 During each morning session, students learned about electric circuits, heat transfer, pressure and temperature relationships, combustion, polymers, and chemical reactions via a series of demonstrations and hands-on activities. Students were even allowed to take home a few “souvenirs” that resulted from the activities of the day! 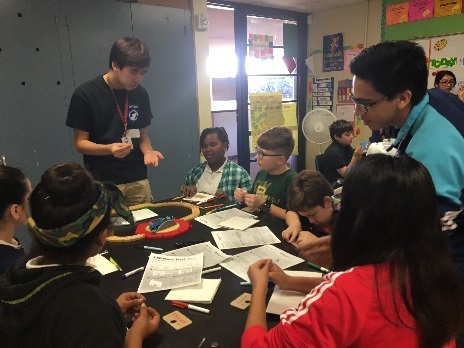 Because science is important in many aspects of life, it’s important to get students interested early and keep them interested throughout middle school, high school, and life after graduation. 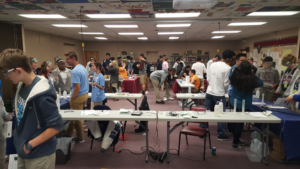 The Westside High School chemistry club hopes to create citizen scientists one demo day at a time, and with the positive feedback from our first presentations, we plan to continue these “Mornings of Chemistry” next school year. Visitors to The Dalles Farmers Market, young and old alike, were invited to take a few minutes from their shopping for fresh produce to learn a little bit about chemistry. 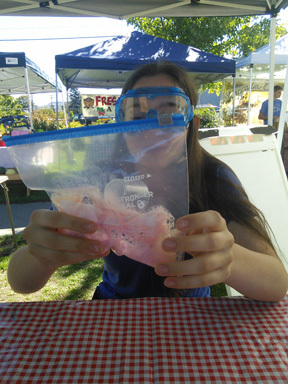 Our ChemClub from The Dalles, Oregon, received a ChemClub Community Activities Grant to fund hands-on activities last summer and fall at our local outdoor Saturday market. Each activity related to color in some way. Our inspiration was the National Chemistry Week 2015 theme Chemistry Colors Our World. Nano bookmarks.Visitors made bookmarks by pulling rectangles of black posterboard through a single drop of clear fingernail polish floated on the surface of a pan of water. Radial chromatography.Visitors decorated squares of fabric using Sharpie markers and drops of rubbing alcohol. Solar S’mores.Visitors made s’mores using solar ovens made out of pizza boxes. The activity highlighted the idea that white light is made up of all the colors of the rainbow. Chem in a Bag.Visitors looked for clues that chemistry was happening in a bag with calcium chloride, baking soda, universal indicator, and water. They observed bubbles, a color change, and a temperature change. Chemeleons. 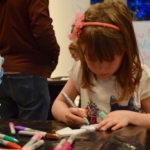 Visitors painted different acids and bases onto pictures of chemeleons that had been soaked in purple cabbage juice. Depending on the pH of the solution, it resulted in a different color on the paper. Every activity began with participants getting a safety stamp. After they listened to the brief safety rules, each person got a fruit-themed rubber stamp inked on their hand. For each of our activities that a child visited, they received an entry into an end-of-market drawing for fun science toys from Educational Innovations. We had a great time, and many people got a chance to try some summer science!